My name is Jackson and I am the local program coordinator for Kids Connection Haiti. Many of you have asked about the situation in Haiti since the riots started two weeks ago and the country hit a humanitarian crisis. I'd like to give you a brief update on how our students are doing. I personally had a short phone call with almost all student during the days that the country was on lock down. Most of them let me know they are safe and doing okay. They kept themselves out of the dangerous areas. Some students were very worried because they didn't have access to anything (no food, no water, imagine that). Last Saturday Menesly (our social worker) and I tried to meet them but many roads were still inaccessible and it was hard to find a taptap (fuel is scarce) so we weren't able to see everyone. Yesterday we received some more of the students in the office. Basically, most of the students are taken care of, but unfortunately we haven't been able to reach everybody yet. We will continue to reach out and help where we can. We are grateful for the extra financial support we have received to donate food and water to our students. In general, this week was much different than the previous one. Most businesses are open again and employees are back to work. The local traffic is functioning tentatively. Grocery stores and markets are open but they're running out of certain items because people want to buy everything they need in case the opposition locks down the country again. The schools' doors are still closed. We hope for classes to restart next Monday. Sadly there is still some gun violence in the streets. Our students and most people are very careful and try to avoid the streets where the demonstrations take place. On behalf of all our students I want to thank you deeply for your kindness and your loyal support. We ask for your continued generosity so that our orphaned students can receive an education and create better futures, not just for themselves, but for their communities as well. Please, keep Haiti in your thoughts and prayers. I am writing to you on behalf of our students in Haiti. Less than a month ago, we - KCH board members and 75 students - were celebrating the arrival of 22 new students. We witnessed their smiling faces; grateful for their education and hopeful for a better future. Sadly, things have changed dramatically since that day. Today is day 8 of the humanitarian crisis that's facing Haiti. Port-au-Prince and other parts of the country are on a lock down. Road blocks, massive demonstrations and violent riots make the city inaccessible. Although in certain areas life goes on as normal, our students and staff - who live in the city - are suffering. Schools and businesses are closed, many roads are blocked with burning tires, and they have no access to food. The students are worried and hungry. One student just sent me a message; he is desperate. He is hungry and, as the oldest of three siblings in KCH, he is worried about his younger sisters. The protestors are angry and tired of their situation. They want the president to resign, claiming corruption. Others claim that the protestors are gang members, paid by the opposition to destroy the country. Regardless of politics, the people who are the poorest, are suffering the most. They feel ignored and neglected. There is an extremely high unemployment rate, limited access to education and healthcare and a big divide between the wealthy and the poor. The situation has not reached most of the international media. I am asking you to acknowledge this beautiful country and to send your thoughts and prayers. How can we justify or even accept for such a crisis to happen, only two hours away from Florida? Let there be peace in Haiti. PS: As soon as schools and roads are open again, KCH will be back in full speed to assist our students in building stronger futures through education. If you'd like to donate to help our orphaned students, please click on the 'Help Haiti' button below. Thank you! A year ago, we made a bold promise. We were helping 30 orphaned students at that time. KCH had been successful with a 99% graduation- and 93% employment rate. It was the perfect moment to increase our impact. So we did. How? and generous donors - like you. We are sincerely humbled and grateful for this amazing result. 64 students are now fully enrolled in our educational program (high school, trade school or university) and an additional 36 are participating in our workshops and social work program. We are hopeful they can all attend full-time education in 2019. Can we count on your support again? With a 'focus on family', forty of our students now have one or more siblings in KCH. Eight students graduated, found employment or continued their education. A former student opened a preschool, another former student was elected employee of the year. For their community service, four students are teaching kids how to re-use and recycle. Three KCH students became interns at KCH, an American volunteer joined our Haiti team. Students participated at national and international conferences, girls attended 'No means No' workshops, and our monthly basic life skills and career development workshops continued throughout the year. The list goes on, and on! Would you consider making a tax-deductible year-end donation? It is not too late...and rest assured that every single dollar makes a difference! Donate here. Dear friend, I wished I could sit down with you and tell you in detail all the progress you've helped make this year for each individual in our program. It is truly incredible! Let's keep the ball rolling...the best is yet to come. The KCH Board of Directors wishes you a blessed 2019 filled with peace, joy and love. PS: Your tax-deductible end-of-the-year gift for 2018 is still in time! Click here to donate, or send a check to the address below. Thank you! The Haitian Constitution requires free education for all. However, the Haitian government has not been able to provide this. Although the educational system is managed by the government, the ministry is not able to provide funding for a lot of public education. Currently, 90% of the education in Haiti is provided by international private- or church affiliated schools. In fact, Haiti has more private schools than any other country, however the majority of the population can’t afford the school fees. In addition, students often need to pay for exams in order to pass on to the next grade. If they can’t pay, their children cannot move on. UNICEF[ii] estimates the following statistics with respect to Haitian education: 76.7% of males and 70.5% of females attend primary school and the survival rate to completion of primary school is 85.1%. In contrast, only 21.6% of males and 29.1% of females attend secondary school. The World Bank[iii] estimates that 8 out of 10 college educated Haitian lives outside of the country. USAID[iv] estimates that the average Haitian 25 years old and older has less than 5 years of schooling and the literacy rate of 15-24 year olds is 72%. The Earthquake in 2010 worsened the situation, destroying infrastructure and displacing 50-90% of the students. 1.3 million children were affected and 4200 schools were destroyed. Over the years the government has tried implementing policies to help improve the educational system but it still has a long way to go[v]. Many NGO’s are helping to improve access to education. Kids Connection Haiti is one of these organizations. We help students attend various levels of education including high school, university, vocational and micro-business training. Our mission is to empower orphans to become contributing, self-sufficient members within their communities through education, life skills training, community service, mentorship, and career development. I recently had the opportunity to travel to Switzerland to join a conference organized by the World Economic Forum – often I say the sky is the limit for my life, but maybe not! For a week in August, I represented Port-au-Prince at the annual meeting of the Global Shapers Community, organized by the Forum, in Geneva, Switzerland. Hundreds of exceptional young adults lead Global Shapers communities worldwide and serve to improve the lives of people around them. This experience with more than 400 Shapers from different countries was very rewarding for me both professionally and personally. On the professional side, I had the opportunity to connect with young adults working in the same field as I do. For me, that is my work for Kids Connection Haiti in Port-au-Prince - empowering orphans to become self-sufficient through education, life skills classes, community service, mentorship and career development. Personally, I met other young people working to inspire young people in their communities. This experience in Switzerland allowed me to see myself differently, aim even bigger in life and inspire other young people in my community. It’s an incentive for me to go beyond the sky’s limit. I would like to thank the whole KCH team for their financial support for this trip. Special thanks to Dave, Astrid, Golnar and Johanna as well as to KCH volunteers and members. Please meet Menesly, our social worker. Menesly not only conducts students’ home visits on a regular basis, he has helped to find internships and jobs, for graduates and is the key person behind our monthly workshops in basic life skills and career development. He’s an inspiration to our students. “My name is Menesly Alexandre. I come from a huge family; seven boys and five girls. My mom was the only one with a little income, my dad, a farmer, was unemployed. There was no money for school. Thankfully, an international organization took me under their wing and provided me with secondary education. Unfortunately my academic career was interrupted several times; I had to move from the country side to the capital, which was hard, then I failed an exam, then the program was eliminated, the earth quake happened, school was suspended for months… it broke my heart but I never gave up. Finally, in September 2010 I got my diploma. Meanwhile, I didn’t sit still! I started to learn English. There was an English club in my church. I went there every Monday and Wednesday to practice. I found work as a translator. I went back to the countryside almost every day to translate for an international mission group. While I was working as a translator, I tried to get into State University. I tried the entrance exam for two different faculties but failed both. Unfortunately private university was not an option since I didn’t have that kind of money. In 2011 I tried again to enter State University, and out of 3500 participants at the contest I was one of the 188 who were accepted. My dream had come true. As I was studying to become a social worker, I continued working as a translator to meet my basic needs. During that time, in 2014, I met this American missionary. When she heard of my challenging background and my wish to use my life experience to help deprived youth, she gave me Astrid’s card – whom she, coincidentally, had just met in the plane. That’s how my career with KCH started. After an interview, Astrid offered me a trainee position for three months, and here I am, four years later, as their full time social worker. Through education, KCH prepares Haitian youth for secure and stable lives. We are unique because we focus on the overlooked group of orphaned young adults. As you know, due to financial constraints, most Haitians are unable to complete their studies. Those who do rely heavily on friends and family. Orphans tend to lack a robust family network. In those cases, KCH steps in and assumes the role of the extended family by providing tuition support, life skills training and job search assistance. Among our general student population are a few who are funded by Water Charities Fundraising [WCF] specifically to pursue studies related to water resources. One benefit of our partnership with Water Charities Fundraising is that, together, we address the individualized needs of each water student. We help young adults with very limited options to learn how to improve the status of water resources in Haiti. KCH has received WCF support for the past three years. To date, five students have benefited from the program. These students have all studied in fields related to water, including engineering, chemistry, education and medicine. Our first water student, Rony Octar, began his studies in civil engineering three years ago. He is now half way through his program. In a few more years, Rony will work to improve the water resources of his country. We are so proud of Rony and all of our water students. Since it's beginning, KCH has relied for the most part on monthly sponsors and periodic, large fundraising events for the dollars we use to help destitute and deserving, orphaned Haitian young adults become financially independent and contributing members of their community. Over the last school year though, we've been able to develop a new income stream that we hope to grow into a major source. Do you drink coffee? Do you know anyone who does? KCH has partnered with Singing Rooster and local schools and clubs to sell organic, fair trade Haitian coffee. Check out www.singingrooster.org. Being a social enterprise, Singing Rooster keeps no profit from its operations. Farmers earn approximately 66% from every bag. The remainder is used for the expenses of roasting, bagging, shipping and warehousing. This constantly innovative non-profit is creating jobs and transferring knowledge all along the entire supply chain and helping to reforest an ecologically devastated country at the same time. School students and club members make a generous and passionate sales force for KCH collecting orders and payment over a set 2 to 4 week period. Well designed, resealable, environmentally friendly bags of delicious, Haitian coffee arrive for distribution a few weeks later. 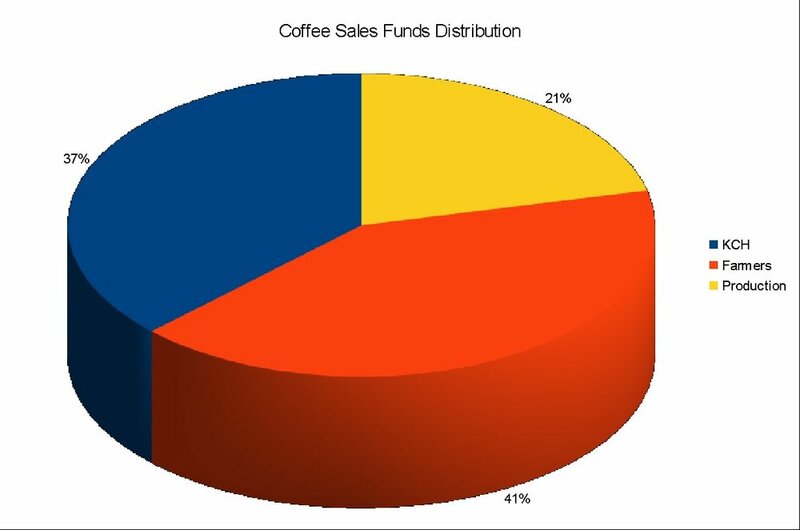 To great effect, teachers have used coffee sale campaigns as a spring board for classroom learning ranging from geography and cultural differences to retail economics and social justice. Every dollar raised by KCH goes to our programs in Haiti. With our 4 pilot events wrapped up and analyzed, we're now ready for full-scale fundraising. We plan to approach more and more schools, groups and clubs until we're holding at least two events every month of the school year. If you think you might know of an interested school, group or club, please contact me at dave@kidsconnectionhaiti.org. It's ready-made volunteerism opportunity. KCH has come a long way in the past 9 years but there's still more to do with our refined and proven approach. With Singing Rooster and partner schools, groups and clubs, we'll help more deserving Haitian young adults pull their entire families out of poverty. We pull over, he throws up, still feeling terrible. A young man runs out of nowhere, pours water on his head and hands him a cloth to wipe his face and just like that he feels better. We thank the young man and continue on our journey. That simple gesture embodies the essence of Haiti to me. I have been around the world and I have yet to encounter people like the ones i grew up around in Port-Au-Prince. The spirit of service and community that is instilled in the Haitian soul is unparalleled. From the private truck owner who stops randomly and let's school children climb and ride towards their destination, the old woman that offers you a place to sleep in a remote village near Grand Goave to the random mom that will defend you in the busy streets of Petion-Ville. People talk about our resilience, our rich history, and our strength but to be honest Haiti is still standing through it all because contrary to popular belief we support and lift each other. As a member of KCH's board, I vow to continue the legacy of my people and continue to show them the support that they've always shown me. Today, exactly 20 years ago, my life changed dramatically. I got into a plane that would bring me to an unknown country. A country that would feel like home straight away. A country, where I would leave my heart, with a culture that would get into my blood. So many kids became ‘my kids’ – they didn’t have a mom. I cried so many hopeless tears for them and my heart would never feel the same again. For me, moving to Haiti was one of those life changing decision that happen only once or twice in a lifetime. As I entered this new life of helping the poor, the sick and the homeless, I had no clue it would mark me forever. I just knew that it was good. That it made a difference. One of my fondest memories is one that still can bring me to tears. I had become very close friends with this nine year old girl, who stayed in the same hospital where I lived at that time. I took care of her in the evenings, after my day job. Christina was sick, and she knew she would die soon. Her parents had abandoned her, too overwhelmed with worries about their seven other children. We spent hours playing together. She was a trouble maker! She wrapped all the nurses around her finger. And she taught me so much. She was chatty and funny, sensitive and spiritual. Sadly, the sicker she got, the quieter she became. Her brain got affected and her lively energy was gone. Life was slowly being sucked out of her. Until she was gone. Christina was maybe the biggest inspiration for me to continue my mission in Haiti. Instead of returning to my home country after one year, I decided I had to stay. There was too much to do, too great a need, too much adventure and too many friendships waiting for me in Haiti. I became close with many kids like Christina. Boys and girls of all ages, and in spite of poverty, loneliness, or sickness, they were radiating courage, light, hope, humor, strength, and resilience. All those kids with ambitions, with talents and commitment to work hard for a better life. They came into my life after that one life changing decision, made in 1998, the decision that turned my life up side down and that planted the seed for Kids Connection Haiti. We hope January was as exciting for you as it was for us. Remember we made the commitment to provide education to 100 students in 2018? Guess what -- we are halfway! How? With the help of many generous friends like you. Why? Because the need is urgent. With a graduation rate of 99%, our students are showing evidence that KCH works. Maxo Francois, KCH 2017 graduate. Having no parents to support him, and coming from extreme poverty, Maxo entered KCH in January 2014. He lived in a simple house without water and electricity, but -- with financial support for education -- managed to finish a two year program in telecommunications. 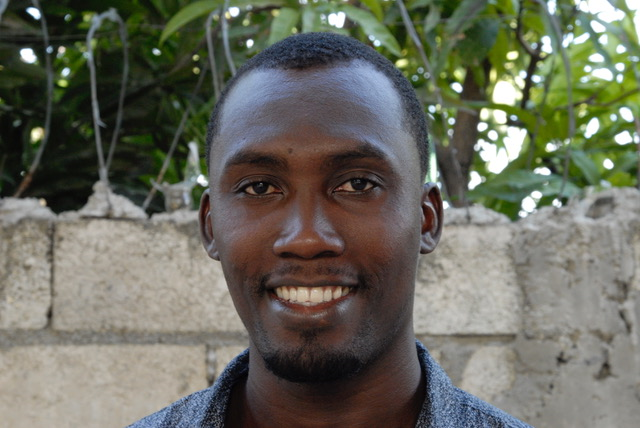 The monthly career development workshops came in useful during his job search before he became a business techniques specialist for the largest telecommunications company in Haiti. Maxo's success would not have been possible without your generous support! Lourdia & Witchelle; New KCH staff. We are very excited to announce the growth of our staff with two former KCH students. The two young ladies Lourdia (Diplomacy) and Witchelle (Law) have offered their services to the KCH team and are working on implementing a solid community service program, registration in Haiti, and out reach to local businesses and communities. As our program is growing rapidly, we will not only need to hire more staff, but we will make every effort to make the program sustainable by hiring staff from amongst our graduated students. Just two examples of how KCH is affecting the lives of young people in Haiti. There are plenty more cases of young adults who came from total despair and who are now not only living more stable lives, but contributing to society as well. Thank you, for giving them something so impactful. Something which they had never dared to hope for. That's the effect of your generosity. We look forward to hearing from you as we continue our journey to helping 100 students in 2018. I am so proud of the ten KCH students who graduated this year. The nurses Sandy, Lounechy and Senise. The accountants Chardley and Carine. Event coordinator Roudeline, tailor Amos, mechanic Frantz, police man R (who wants to stay anonymous), and chemical scientist Esnel. Boom! Ten young adults, who are now at the beginning of a new life. Eager to bloom. With diploma in hand, the future looks bright. You, my friend, have played an essential role in their success. Your generosity and your kindness has turned multiple lives completely upside-down… in a good way! Let’s do this again. Let’s do it more. Let’s fight harder. These young men and women inspire me to no end. Something good is happening… and I want you on my side. I COMMIT TO GROW KCH FROM 30 TO 100 STUDENTS BEFORE THE END OF 2018. That is my commitment and nothing is going to stop me! There is a huge need in Haiti (40% illiteracy, 40% unemployment, 60% living in poverty), and there are many, many, many young adults impatiently waiting for a chance to change their destiny and the dynamic of their communities. I know we can do it. All I need is you on my side. Can I count on your help? LET’S SPREAD LOVE. COMPASSION. KINDNESS. Our hearts melt when we see a two-year-old crying for attention. The “Mother Theresa” wakes up in all of us when we’re exposed to a picture of a malnourished child. Our spirits fill with hope when a handicapped athlete wins a triathlon. But when we see a poor, unemployed young adult, we feel nothing. The orphaned young adult population is a forgotten group. It’s a problem, not unique to one community or geographic region. In Haiti, a country of an estimated 430.000 orphans and roughly 760 orphanages, ‘post-orphanage care’ is hard to find. Management teams of orphanages worry not only about food, education or beds but mostly about the future of each orphaned child and what will become of them. The truth is, only a few lucky ones will find a job, the academically advanced ones will win scholarships to universities, maybe even become part of the management team at the institution where they grew up. On average, orphaned young adults are far behind in school, have no professional networks or skills and – due to the existing stigma of orphans – have no viable job opportunities. The more likely path for these orphans is to poverty. They have no parents, remember? That’s where it all starts. Just think of where we learn structure. Where do we learn discipline, trust, and communication? At the dinner table every evening, on evening walks, when tucked in at night, with and by our parents! If all these little moments of one-on-one time with a grown up are non-existent, how would you know that honesty brings you further than slyness, that $100.00 next month is worth more than $5.00 today? This is not to say that orphanages are failing on all levels. They still provide safety, food, and shelter, which are the basic ingredients for survival. But the next step to a fulfilling, productive, and financially independent life is almost destined to fail if there’s no adult guiding you, loving you, and showing you the way. Orphaned young adults desperately need our attention as the economic and social status of a parent will define the academic and professional development of a child. Take a moment to imagine what your life could look like if you had lacked a parent. In the developing world, this problem is much more pervasive, and we are now seeing a large population of orphaned young adults struggling for survival. Thousands of NGO’s in Haiti with impressive, sustainable programs are failing in this area. Orphanages could possibly improve in this area by providing adult mentors, and big brother/big sister programs – already put in place by some orphanages. Much more effective would be to support young children within family situations, rather than in orphanages, a trend that thankfully is growing, slowly but surely. The positive and personal attention of an adult is so powerful that even at this later stage in life, we see the young adult blossom. We see their self-esteem increase. We see their eyes filled with love and gratefulness – because they feel valued, they are seen, and their existence is acknowledged. The undeniable impact will trickle on to their little ones, once they become parents themselves. We need to take responsibility not just for the babies, the little ones, and the handicapped ones – young adults are our near future! Let’s help them, guide them and love them. They deserve it. In support of the World Banks #EndPoverty campaign, this blog post explains the importance of post-orphanage care - and why Kids Connection Haiti exists. We just returned from a very inspiring trip to Port-au-Prince, filled with impressions, experiences and emotions. Haiti is a beautiful country with green mountains, blue ocean, and pristine white beaches, what a contrast, to the challenged neighborhoods in Port-au-Prince, where life is a daily battle for many who are struggling to get by, especially orphaned young adults who are often left on their own. During our trip, we visited several students at their homes in the very poor parts of Port-au-Prince. Although people live in poverty, it is beautiful and endearing to experience their warmth, friendship, generosity, and hospitality. Seeing the students at home really makes you understand the need to support them in their quest for financial independency. We also visited many schools and discussed potential partnerships and negotiated tuition fees. Partnering with school provides us with the opportunity to expand KCH’s impact, and by controlling the cost, help more students. During the weekend, we spent a day with almost thirty of our students in the mountains. As part of the community service, we visited an ecological farm to educate the students on how to treat and preserve their environment - a topic that in Port-au-Prince is not often a priority, due to more pressing issues like hunger and housing. Most of our students do not get the chance to get out of the city too often, and it was amazing to see how much they enjoyed this day! Before we left for the mountains we met two new adolescents with whom one of our alumni students had asked us to meet. Our alumni student has been taking care of the two, who are both orphans and have been living on the street since the earthquake in 2010. Hearing their story and their dire need for help was truly heartbreaking. You could just feel the weight on their shoulders and numbness in their faces from their harsh experiences. From a very sad and heavy start they joined us on the hike to the ecological farm and during the day they opened up, smiled, and enjoyed just being part of a group of kids of their own age and being out in the nature. Now, a few weeks later, they have done the intake with our coordinator. KCH has provided both with housing and they have selected their school. Change happens at small steps; yet seeing these kids’ faces going from numb to smiling was a very touching experience. Picture the impact of renewed hope. As a KCH board member, it is inspiring to meet the students and staff in Haiti. I’m grateful to be part of KCH and proud of the strong and resilient students in the program. The week was very well coordinated by the KCH staff in Haiti, all the work they put in made it a truly amazing experience. I would also like to thank and compliment both Jackson and Menesly for the commitment and dedication to KCH and the students in our program. After our recent experiences in Haiti, we are even more dedicated to our goal to grow the program to 100 students in 2018 because there are so many more young adults to help. If you find it in your heart, become a part of KCH and make a difference. Although change starts with small steps, it does happen, if only we do not look away. Become a sustainable sponsor and help a student change his or her own life by becoming financially independent through education. In a hopeless situation, it sometimes just requires one person to reach out to them and make them feel part of something. Hope does change lives! 20, 30, 40... 50 students in January? Let's do it! It is Giving Tuesday. After Thanksgiving, Black Friday and Cyber Monday, it is time for some good-doing. Doing good works on any day of the year, however this Giving Tuesday might be just the right moment for you. Your support counts. Any time, and big time! Make a difference for young adults, like Katia, Stevenson and Johanne, waiting for support, ready to start their education. Your kindness will last way longer than just a given Tuesday. Katia, 18 years old. Lost both parents during the 2010 earthquake. Lived on the streets for years. Thanks to your help, Katia is now living in a safe home and attending high school. Stevenson, 18 years old. Lost both parents during the 2010 earthquake. Lived in a violent home for years. Now attending high school and living in a safe house with other KCH students. Johanne, 25 years old. Used to live in a dangerous area in a shed without any furniture but a rug to sleep on. Now studying nursing and sharing a house with Katia. Today is her last day in the Dominican Republic. A group of kids is lining up to hug her goodbye. KCH student Witchelle is returning to Haiti after a two month internship at the legal office of an orphanage in the DR.
Four years ago, we met Witchelle. She had lost both her parents at a very young age and lived with the family of a friend. They struggled to get by. There was barely any food. There was absolutely no money for education. Witchelle was smart, hardworking and, she had a dream: to become a lawyer and defend children’s rights. KCH offered Witchelle a way to follow her dream. With our financial support, she entered university where she studied law (and Spanish, on the side). Witchelle worked side by side with the lawyer at the orphanage. She helped with the registration process for kids without birth certificate. She also had the opportunity to work with another organization named ASCALA. In a few months, Witchelle will finish her final thesis. We are super proud of her and confident that she will be an excellent and compassionate lawyer for children’s rights! Would you like to contribute to a successful education and professional career for orphaned young adults like Witchelle? Please consider becoming a monthly sponsor. Sign up at www.kidsconnectionhaiti.org.Thank you! Sustainability is key. And we've kept that in mind since the early days of KCH. The intent all along has been to provide the students with the tools they need to find gainful employment – so they can be financially independent. During my last trip to Haiti, the students themselves took the next step. They suggested they make and sell macrame sandals as a source of income for KCH and a way for them to give rather than only to receive. We on the Board of Directors have tossed around ideas like this before and we've talked about ways to find donors in Haiti to make KCH sustainable in Haiti. The students' proposal was a great moment for both the students' own ownership and self-esteem and for KCH to move towards local sustainability. We've since opened the planning up to more or different products and we've begun to more precisely identify costs and local markets. When we have a sound business model for our new social enterprise, I hope to begin trial production. The sense of accomplishment and self-sufficiency for the students can't be understated. The objective of sustainability also can't be understated. Helping Haitian young adults to help themselves is something we can all be proud of. Thanks so much for believing in the students and in KCH. Who doesn't love a good old recycling project? Who doesn't love a good old recycling project? We certainly do!!! This old beaten up shipping container got a make over and turned into our new Haitian office space. 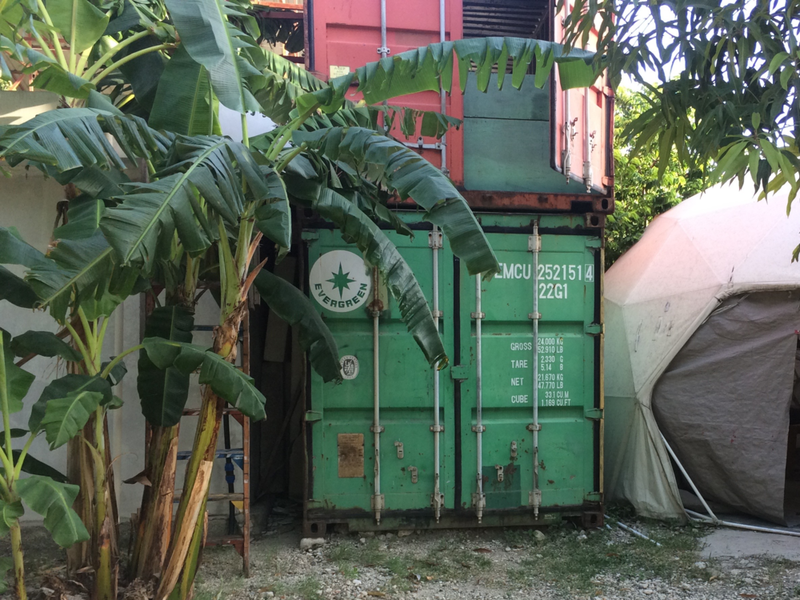 One of our partner organizations, Haiti Comunitere, converted the container for us, painted it in Caribbean colors, installed electricity, cut out the windows and custom made the furniture. How about we all donate 1%? Do we have 100 friends who are willing to help us with $40? PS2: Would you rather leave a long term and personal impact on a students educational path? Please visit www.kidsconnectionhaiti.org/donation-page to sign up for sponsorship! No, not the one that was interrupted by your alarm clock this morning. Your real dreams. The ones you had a kid. I remember wanting to become a doctor. Then an author, later, a gymnastics teacher, an interpreter… and so on. My goals and visions changed constantly, as I was growing up…but there was one dream that stayed with me. One that did come true. Did you ever realize one of your dreams? How did you do it? Personally I know that my biggest dream has come true, thanks to other people. Not just my parents – though they played a huge role – but thanks to a ton of people… including YOU. See, MY dream was to help the orphans. You helped me to realize it. And the coolest part of it all? This whole dream is all about making dreams come true! Thanks to you, dear sponsor, orphaned young adults in Haiti can realize their goals and objectives for a better future. Since 2010, 37 young adults have graduated out of Kids Connection Haiti and thirty of our graduates have found paid employment. This is great, but we can do better. We can reach out to more orphaned, homeless and poverty stricken kids and help them move forward. That’s why this year, we’re going to aim higher. In 2017-2018, KCH is committed to support fifty young adults with their school, housing and employment. Basically it means we’re doubling our program. Fifty young adults with a simple dream – to learn a trade and find a job. All they need is your help. Will you spread the word, become a sponsor or increase your monthly donation? We’d be forever grateful. And we hope that all your dreams, and theirs, may keep on coming true. PS: Please visit www.kidsconnectionhaiti.org and click on ‘donate’ to make their dreams come true! Taking photographs in Haiti is both challenging and inspirational. Challenging because in a whirlwind tour you are trying to catch those special glimpses of life in Haiti and the lives of individual orphans who have overcome so much. How do you do this in a few short days. Photos tell a story but they capture only a short moment in time and do not tell the complete story about how some of the young adults that Kids Connection Haiti is helping are becoming the future leaders in their community and having access to opportunities which unfortunately many in Haiti do not have. Hearing about how these young adults are transforming their lives is inspirational. We went to visit Senise, this young woman is studying to be a nurse. She went to hurricane struck area to help family and community with her nursing skills. Taught about clean water and hygiene and how to treat the water to make it safe to consume. Made me think about how easy we have it in our own house where we can trust that the water that comes out of the faucet is completely safe. In Haiti most people do not have running water or electricity. This is just one story about how Kids Connection Haiti is not only transforming the lives of individuals but also helping to improve the lives of others in the community. Haiti is a beautiful country and I was fortunate to be able to play a small role in recording the lives of the young adults that this NGO is helping. Every time I go to Haiti I am learning about the country and learning something new about how young people are overcoming challenges. It makes me think about what is possible and how if we all come together we can truly work together to overcome some of the problems we all face in this changing world. Spend time in Haiti is an incredible experience, it opens my heart to happiness, sadness, joy, incredulity, color, beautiful chaos, and humanity. I love it! Kids Connection Haiti provides life-changing opportunities for orphaned youth in Haiti to break the cycle of poverty and to contribute to sustainable and financial independent lives. Do you want to become a part of this and help a student achieving their goals? Are you interested in becoming a partner of Kids Connection Haiti or are you interested in contributing as a volunteer? Please use the contact page to leave a message or contact us at info@kidsconnectionhaiti.org.